Have any questions? We prepared a list of commonly asked questions and hope It could clear your doubts. Q: What is a furry? A: Furry refers to a person from the furry fandom. It is a subculture interested in fictional anthropomorphic animal characters with human personalities and characteristics. Examples of anthropomorphic attributes include exhibiting human intelligence and facial expressions, the ability to speak, walk on two legs, and wear clothes. A: FURUM, Furs Upon Malaysia is a furry convention to be held in Kuala Lumpur, Malaysia. A furry convention is a gathering for members of the furry fandom - people who are interested in the concept of fictional non-human characters with human characteristics. It is a place to meet, exchange ideas and to have fun! Q: What do I need to get in to FURUM? A:A paid registration with a suitable photo ID that states your birthdate. If you're under 18, you will also need to have your parent, guardian or your nominated carer with you. Q: I don’t have a drivers license/ID card, will a XXXXX card suffice? A: Any officially issued photo ID with a date of birth will do. We just need to make sure we're giving you the right registration, and that you are over 18 if you're attending FURUM unaccompanied. Q: Do I have to be over 18 to attend? A: FURUM is a 13+ convention, however minors under the age of 18 shall be accompanied by parent or guardian at all times. 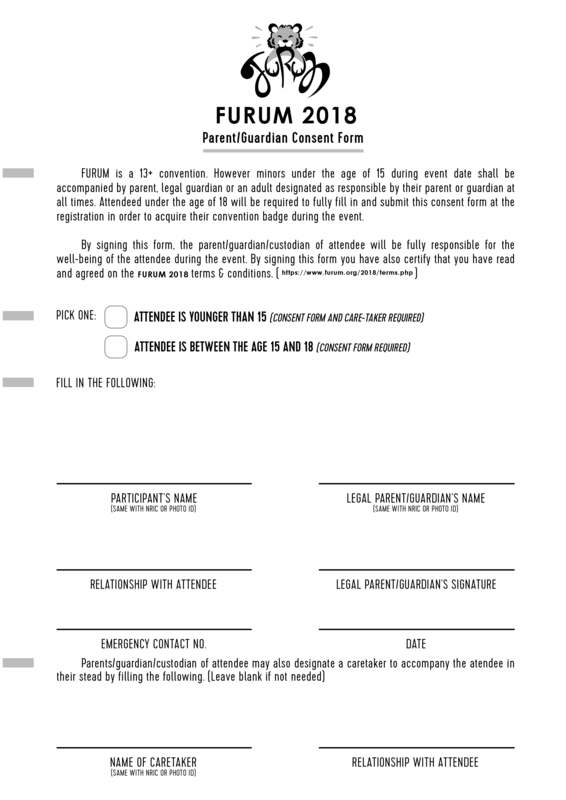 Do note that if you're under 18, you'll have to send us a copy of parental consent form (have it printed out, filled in and scanned/photographed, then attach it with your registration form) in order to acquire your con-badge. Your parent/guardian/caretaker will be issued a parent/guardian badge, however they MUST come with you to the registration desk for badge collection at FURUM. You CANNOT collect your badge or attend without them! Q: Can I register on that day? A: Unfortunately currently walk-in registration is not available due to limited event space. Q: How do I know if my registration has gone through? A: You will receive an email from us. Q: Can I change my Passcode? A: No, you can't change your Passcode. However, if you forgot/lost your passcode, you can send us an e-mail and we will reset it for you. A: You can drop us an email and we will reset and send the passcode to your registered e-mail. Q: I don’t have a paypal account. Can I still register to FURUM? A: Yes. Paypal also accepts debit/credit card even if you are not a registered PayPal user. Please select "Pay with Debit/Credit Card". Q: I can't make it to the event, can I obtain a refund or transfer the registration to other person? A: Unfortunately registrations are non-transferable or refundable. Q: Can I volunteer at FURUM? A: We are not recruiting any volunteer at this moment, however once we consolidate all the details we will announce for recruitment.